AB and gloves: turning point? Perth - South African vice-captain AB de Villiers said on Sunday the Proteas were not taking anything for granted, despite being in a seemingly unbeatable position in the final Test against Australia at the WACA Ground. De Villiers made 169 as the Proteas piled on 569 in their second innings to set Australia an improbable 632 runs to win in just over two days of cricket. 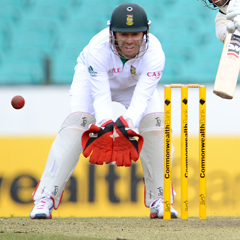 Australia reached 40 without loss at stumps on day three, still 591 runs behind South Africa. It was the second-biggest target Australia had ever been set in Test cricket, and they need to substantially beat the current record run chase to win the match and claim the top ranking in Test cricket off the South Africans. The world record run chase stands at 418, set by the West Indies against Australia in Antigua in 2003. However, wicketkeeper De Villiers said it was too early for the South Africans to celebrate spoiling retiring Australian batsman Ricky Ponting's farewell match. Perhaps mindful that he was part of the South African team that reached a victory target of 414 on the final day in Perth in 2008 for the loss of just four wickets, De Villiers said there was still a lot of work to be done before they won the match and the series. "We haven't ruined anything yet," he said of Ponting's last match. "We are aware that if they we go the full length of the Test match they will come quite close. "They won't be giving it away, we are aware of that and we are not arrogant in any way whatsoever. "We have a lot of hard work ahead of us tomorrow. "We haven't ruined his (Ponting's) last Test match yet, but hopefully we do." De Villiers said the WACA pitch was still a good batting wicket, but he expected that to change over the last two days of the match. "It is playing quite well," he said of the pitch. "We are hoping that it will break up a little bit over the next couple of days, there are a couple of cracks that are developing and hopefully they do open up for us." Personally, De Villiers ended a mini-drought with the bat in scoring his 14th Test century, bringing up the milestone in remarkable fashion with three successive reverse sweeps to the boundary off spinner Nathan Lyon. It was his first century in nine Tests, his indifferent form leading to speculation over his ability to perform with the bat while also taking the wicketkeeping duties. However, De Villiers is committed to the dual role. "I felt it coming for a long time," he said of the innings. "There is a bit of pressure on me with the gloves, I feel really proud about what happened today. "I don't think people believe me, but I honestly don't think I am getting as tired when I am wicketkeeping. "I really enjoy having the gloves."